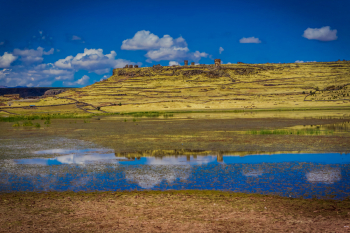 I was so excited to see Lake Titicaca as it has always been one of my “Bucket List” destinations. What I could never have imagined was just how massive and breathtaking the lake truly is. On the way from the Juliaca Airport to Puno (the main city of Lake Titicaca), I took a detour with my travel mate to see the Great Cemetery of Hatun Colla. 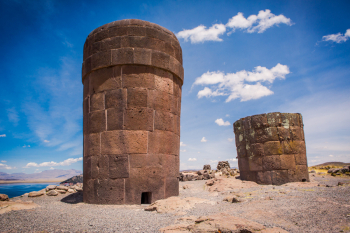 These are the tombs of Sillustani, a pre-Incan burial ground in which tombs were built as tall, above ground towers called Chullpas and likely held the remains of noble families of the time. The stonework of the era was so perfect and meticulous that to this day even a single piece of paper cannot be slipped between the cracks of the stones! I of course had to climb inside of one of these cisterns to see for myself what was inside. To my disappointment the mummies and riches have long been looted, but it still was amazing to sit inside and feel the energy of the tomb. 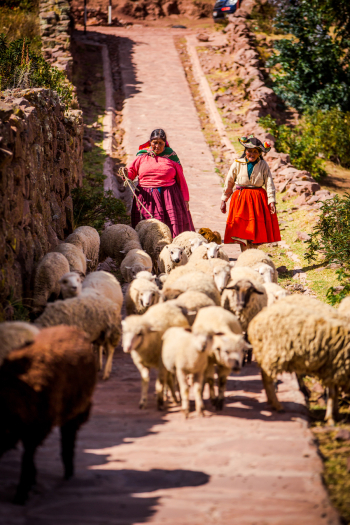 In Pueblo de Llachon alpacas and sheep are a huge part of the small town’s lifestyle. The animals were so cute and even the children of the town had their own sheep! All the people of the town were incredibly warm and welcoming, and one woman invited us into her home to see how she worked and lived. 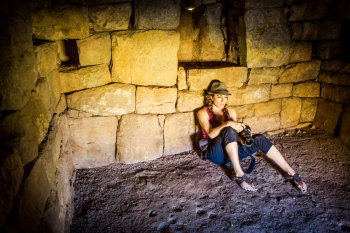 Her days were spent weaving, cooking and grinding herbs for food. Each home had built a stone wall around the perimeter and was somewhat of a mini compound of stone buildings for their family and animals. The main entrance had small, ceramic bull sculptures on their rooftops; the bulls are always in a pair and placed on top the house to protect and bless the inhabitants. Once we were inside the house it was hard to comprehend how simply they lived and how little they needed to survive. Nonetheless, these families still exuded feelings of joy and didn’t dwell on what they do not possess; it was harshly eye-opening, but also inspiring to see how they live off the land. While in Pueblo de Llachon we met the most adorable couple, Juan and Juanita. They had been married for almost thirty years and invited us into their home to spend the day. While they prepared tea for us they had us change and wear their traditional dresses so we were more comfortable and warm (and so we didn’t stick out like a sore thumb when walking around town!) 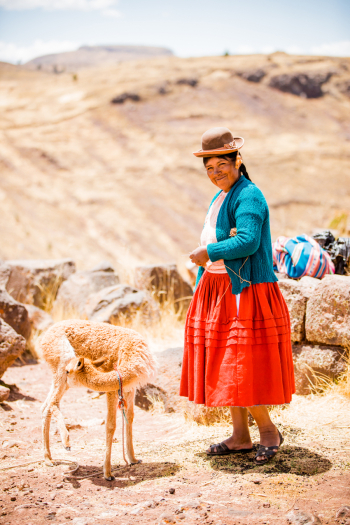 Their outfits are so vibrant and colorful and all hand-woven with naturally dyed materials. The shirts have layers upon layers of warm wool, so you feel like you are wrapped in a blanket while wearing one. I began to understand why they dressed this way! Every village wears a different kind of woven hat. The type of hat and design signifies your importance in the community or whether you are married or single. Wearing a woven sticking cap usually means you are still on the market! Juanita spent hours catching and preparing trout for us to eat, while Juan took us for a trip on the lake in his boat. 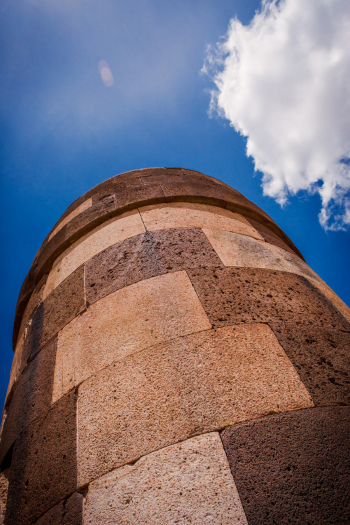 Afterward, we all went for a walk through town to the edge of Lake Titicaca. The land seems to just drop off the face of a cliff and all of a sudden I had my first glimpse of the lake; it was stunning! Lake Titicaca is up in the Andes mountains between the border of Peru and Bolivia, and it is the largest lake in South America. By the end of the hike to the lake, I was definitely starting to feel the effects of the altitude, but nothing was going to keep me from seeing the pristine waters. The lake is so perfectly blue and clear that the clouds reflect in the water like a giant mirror giving the impression of two skies. There were other hikers around and young couples basking in small, romantic moments while overlooking the lake; it was peaceful and wonderful! 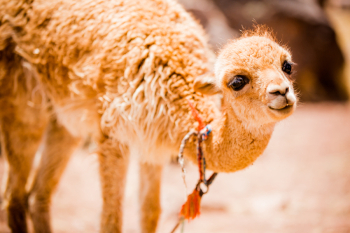 Laura Grier is an adventure travel and destination wedding photographer. Follow her adventures on her blog, Wanderlust by Laura Grier. These photos are phenomenal — it can be so difficult to capture people while traveling and I love all the expressions, color and life in these photos.